I recently learned that, for this year’s birthday, I get to import some fountain pen inks! It's still a couple of months away but I just couldn't wait. The problem being that I can’t try out any samples beforehand. The price of importing them wouldn't be worth it, for me. Which means I usually read a lot of reviews before buying any inks, and that has worked for me so far! This time, however, I’m having a hard time finding enough reviews. So I’m asking for help in figuring out which ink colors I want. 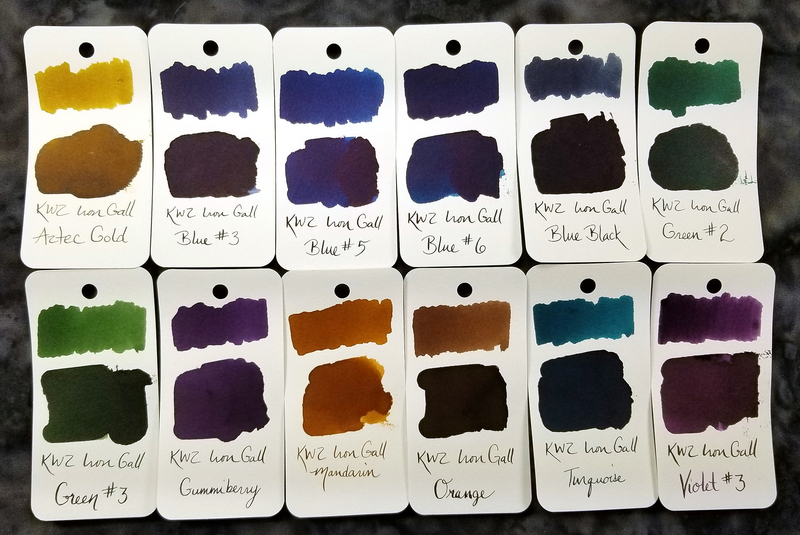 I’m already fairly sure of the brand I want: I’ve always liked the idea of very resistant and colorful inks, so I’d like to try and get my hands on some KWZ Iron Gall inks. But I’ve read tales of IG inks losing color after being opened. Is that a worry for KWZ? All colors - I’m very fond of shading, and I’d like for the inks not to be too dark… by which I mean I’m okay with dark colors, I just don’t want anything too greyish or black-looking. BLUES - I also already have an IG blue so I won’t be looking at those. GREENS - I’m very interested, but I’m finding it hard to pinpoint all the shades. How similar are IG Green #1 and #2? What about #3 and #4, and what about IG Green Gold? I’ve also heard that #3 borders on black. BROWNS - the contenders being IG Gold and IG Mandarin. How similar is Gold to Green Gold? Is Mandarin a pure brown or does it have warmer orange undertones, and how much do they show? VIOLETS - what are the differences between the Violets and Gummiberry? It is my understanding that Violet #2 is duskier, Violet #3 is more vibrant, and Gummiberry leans more towards blue. Is that correct? Do any of the above tend to shade, and how much? Paper - I use white paper most of the time, but I also have a couple of nice ivory/cream paper notebooks (specifically pollen paper) I'd like to write on, so does anybody know if any of these looks particularly good on ivory paper? I love the Mandarin. I find it to be a brown brown, with no orange component once it oxidizes, which it will do right before your eyes. When it's new. Mine seems to have oxidized in the bottle, and now it goes down a light brown, changing to a darker brown. Since that's the color of brown I wanted anyway--a dark brown with no red component (like most any other brown I'm familiar with)--I'm not overly concerned about it having oxidized in the bottle, but I do kinda miss its going on orange and then changing. Not a deal killer, though. It's my favorite brown. I think IG Turquoise is a really good looking ink. A green leaning teal that darkens slowly. Violet #2 goes down looking like Herbin’s Pousserie de Lune (anemic) but darkens down nicely. If you can’t get Gummiberry, it’s not a bad alternate. Look in the ink forum as there are fabulous reviews of all the colors. Unlike some other IG inks, it is rich and wet and requires high quality, non-absorbent paper. A colleague of mine bought it without trying it first and was disappointed to find that he couldn't use it to take notes, because it bled through the paper in the notebooks we have at the office. I don't know how other KWZI IG inks compare in this regard. With any IG ink, it is important to flush the pen thoroughly, and Violet #3 takes a long time to flush! Have fun with your birthday inks. I have both IG Violet #3 and IG Gummiberry. IG Violet #3 is more of a red violet, and IG Gummiberry is definitely a blue violet. IG Turquoise has great shading but I don't really care for the color (I haven't tried standard Turquoise) As far as the greens go, I have IG Green #3, which is a medium green, and (standard) Green-gold #2, which is similar (but a little less yellow) to R&K Alt-Goldgrun. I blow hot and cold on IG Mandarin; have not tried IG Gold. Didn't really like IG Red (and sadly missed out on IG Cherry, which I suspect I would have liked better...). The only KWZI IG ink I have is IG Turquoise. Love it. Haven't used it in a while, but may need to change that soon. The cherry is the only KWZ I’ve had hard starting issues with so far. Glorious color, but it gives my Visconti stub heartburn after sitting overnight. Thank you so much to everybody who's answered so far! I really appreciate it, especially those of you who gave me detailed information. I hope you don't mind if I ask further questions! Thank you for the comprehensive description of IG Mandarin, I hoped for something like this. It does sound like a lovely color! Thank you, also, for answering my question on how iron gall inks are likely to behave after a while. I have one last question, though it's mostly for the record right now: how is IG Mandarin's shading? A vote for a (kind of) blue... well, I guess I'll have to take another look at that one. Thanks for the vote. Thank you for the information, and yours is the second vote for Turquoise... I'll look more carefully into that one. From what I understand, you think IG Gummiberry is the superior choice, correct? Since you called it an "alternate", is IG Violet #2 similar to Gummiberry? The pictures I found made it look somewhat redder and greyish, compared to the blueish, more vibrant but nearly black IG Gummiberry. As for the ink reviews here, thank you for the reminder. But I've probably already read them. I even used Google to track down any reviews, comparisons, or mentions of KWZ's IG inks that might be a little harder to find. My issue is that I usually read a lot of reviews and track down many many photos before committing to an ink. Thanks to KWZ being less reviewed than the usual suspects, I don't have enough information so far to pick the exact shades I want. Thank you for the description and for the very useful warnings. I'll keep them in mind, particularly on flushing the pen. The paper I normally use isn't too bad so hopefully if I go with IG Violet #3 that will be a non issue. One last question, if you don't mind - what is the shading like? Thank you for your help. Would you mind if I asked a few further questions? For a start, would you say that IG Violet #3 and IG Gummiberry are different enough to merit owning both? How dark are they? The pictures I saw of Violet #3 were clearly a violet ink but quite a few of Gummiberry looked too near black to my tastes. Likewise, how near black is IG Green #3? I already have a great description of IG Mandarin, but would not mind a second opinion on it. Thank you once again for all the help, and please keep the opinions coming! Glassgauze, going back through my scribblings I notice that KWZ Mandarin has moderate to good shading with a 1.1 stub nib; I wouldn't call it profound. I don't believe I have any broad nibs (other than stubs) to test it with however. With a fine nib (western fine--Bexley) I notice not much shading really to speak of. Some, but very little. Rhodia pad yellow lined paper 90 gsm. Yes, I think having both IG Violet #3 and IG Gummiberry is a good thing -- they are very different looking. If I needed to use something business appropriate (and could get away with something that wasn't blue, blue/black, or black) it would probably work. IG Violet #3 is a a lot brighter and more vibrant (not really "businesslike" except if you were having to do markup). Of course if you were restricted to blue, blue/black or black.... I personally think it's a tossup between IG Blue-Black and IG Blue #3 (both are fabulous). IG Green #3 doesn't really go black at all -- it's more like a medium/dark green in my recollection. I think I may have IG Red #1 (since I got it long ago enough that there was *only* one IG red ink they made -- my original group of KWZI inks were from a group buy a few years ago). I have several of the inks mentioned throughout this thread, and thought I'd share a picture of them all side-by-side. Photo was taken under daylight lamps and adjusted for white balance, so the colors should be relatively accurate (although computer monitors all display colors differently depending on their settings, so keep that in mind). Edited by KreepyKen, 24 March 2018 - 18:33. Third vote for Turquoise... wow, seems like this ink is really popular! Thank you! Seems like the KWZ IG inks shade less than your usual IG ink, which is quite surprising, but I think I'm okay with it. Thank you for all the extra information! I'm thankfully not currently restricted to business colors, but I'll keep your blue recommendations in mind anyway. And thanks for the info on IG Green #3 and Mandarin, too! Both sound like very interesting colors, although I'm sorry to hear you don't love the color Mandarin ends up as. Oh wow thank you so much for the pictures! They do help a lot. It's particularly interesting to be able to see Mandarin side by side with Orange, but I'm also very glad for the Green #3 and the Gummiberry/Violet #3 comparison. Thanks again! The one KWZI irons gall ink I have used is IG Gold. Depending on nib, it has what I would consider moderate shading in the yelow-brown spectrum. In a drier pen, that shading is still evident once dry. In a fairly wet pen, it goes down darker and dries to a dark brown, leaning towards black. I find it especially nice on yellow leaning papers. Edited by theLorekeeper, 25 March 2018 - 18:32. I thought we could only pick one. Thank you so much for your input! I like the sound of IG Gold. I know you didn't mention Red in your list, but I have to say that KWZ IG Red #3 is my favourite. It goes down bright scarlet and dries to a dark wine (very readable, doesn't hurt the eyes). Let us know what you choose and how you got on.